Our professional-grade equipment helps with the toughest of jobs and produces amazing results for our clients. 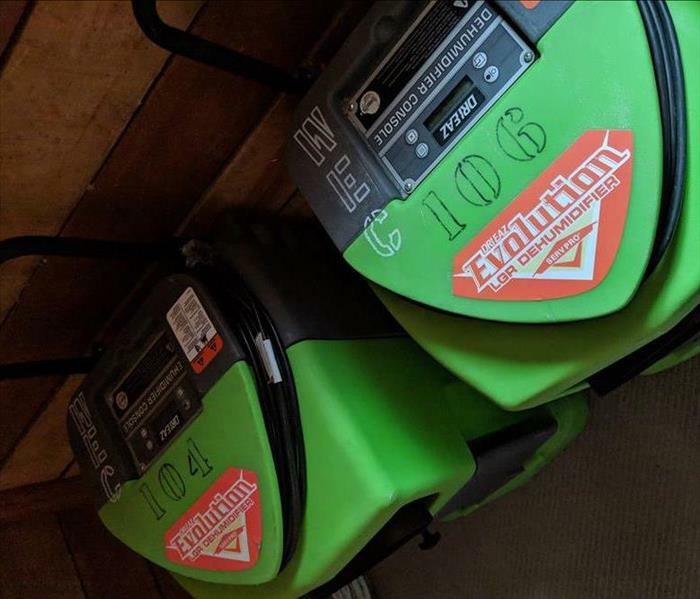 As a water mitigation company, SERVPRO of West Erie County uses professional-grade equipment to help with the toughest of jobs and produce amazing results for our clients. Having a powerful dehumidifier is a very important tool to have. But what type of dehumidifier do our customers actually need? That decision usually comes down to two types; Low-Grain Refrigerant (LGR) and Conventional dehumidifiers. Of these two, LGRs are more efficient. They incorporate an extra step in the cooling process which leads to lower air temps in the moisture-filled space. Heat Pipe System – this system collects hot air, cools it, then heats and evaporates it once more. This process is repeated over and over with the aim of removing moisture from the air. Thermal Siphon System – this system uses a stacked hot and cold coil to perform the same type of repeated cycle as the heat pipe system. Air-to-Air Heat Exchanger – this system uses air to transfer heat rather than liquid refrigerants. Conventional dehumidifiers condense water vapor by passing air over refrigerated coils. They also contain a heat pipe that prevents frost from forming. When compared to LGR dehumidifiers, Conventional models are not as efficient at removing moisture and drying environments with large volumes of water. At SERVPRO of West Erie County, we take pride in having state of the art equipment and technology that help our professionals do their jobs and deliver the greatest results. If you are experiencing water damage, call SERVPRO Of West Erie County at (814) 806-1987. Stay connected with us on Facebook for the latest tips and information. Mold is a fungus that sprout microscopic spores. What causes mold to grow in your home? It needs the right conditions. Mold spores need to be present in order to grow. Mold needs a food source like wood or cotton or drywall. Mold needs warmth. It doesn’t grow in freezing temperatures. It needs oxygen, which is in the air. It likes darkness and can’t grow under ultraviolet lights. And, it loves moisture, humidity, dampness. Mold loves humidity. When it’s rainy outside and the humidity is high, mold can start to grow and can grow quickly. This is why, when you experience water damage, SERVPRO wants to start remediating your damage immediately to help avoid growth in your home. If you live in an area with high humidity, which can be an issue for Erie, PA residents because we live near a body of water, then mold can be a recurring problem. Erie residents need to keep the conditions that contribute to mold growth under control. Our series will start with the Bathroom. The bathroom is a very moist room due to showers, baths and toilets. If not properly ventilated, it is a perfect place for mold growth. Where to check for mold in the bathroom. Check shampoo bottles, wash cloths and loofahs. Check shower curtains, toothbrush caddies. Around faucets and shower heads. 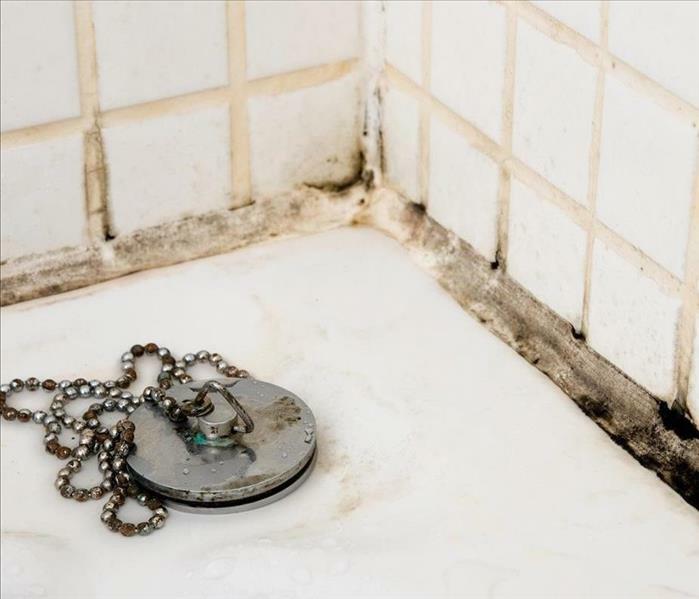 Bathrooms are rooms that have an environment perfect for mold growth. Tips to fight against mold in the bathroom. Wash items often such as towels, wash cloths, shower curtains and rugs. Replace loofahs and toothbrushes regularly. Use a ventilation fan while showering and make sure it is vented properly. A dehumidifier or air conditioner keeps humidity down. Keep all surfaces (showers, sinks, toilets, tile, floors) clean and dry. Check for leaky faucets and toilets. If you still find yourself in need of mold remediation, call SERVPRO of West Erie County at 814-806-1987. In the world of restoration, fire and water damage can be very overwhelming to a property owner. 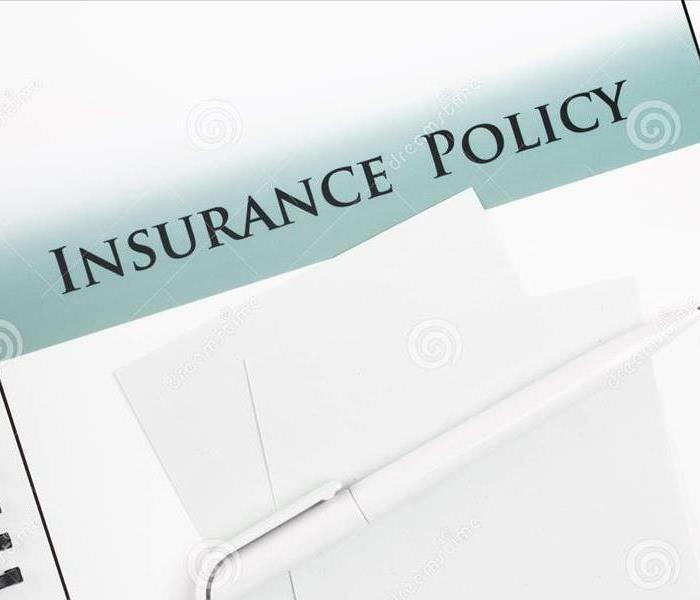 However, property damage resulting from a suicide or an unattended death poses great risk to the policyholder and adjuster. Our technicians at SERVPRO of West Erie County are ready to respond during your time of need. We are highly trained in bioremediation and truly understand the science behind the decontamination process. In every biohazard crime scene there are always health risks. The process to recovery begins with restoring the surroundings so that there is once again a refuge to come home to at the end of the day and find peace. 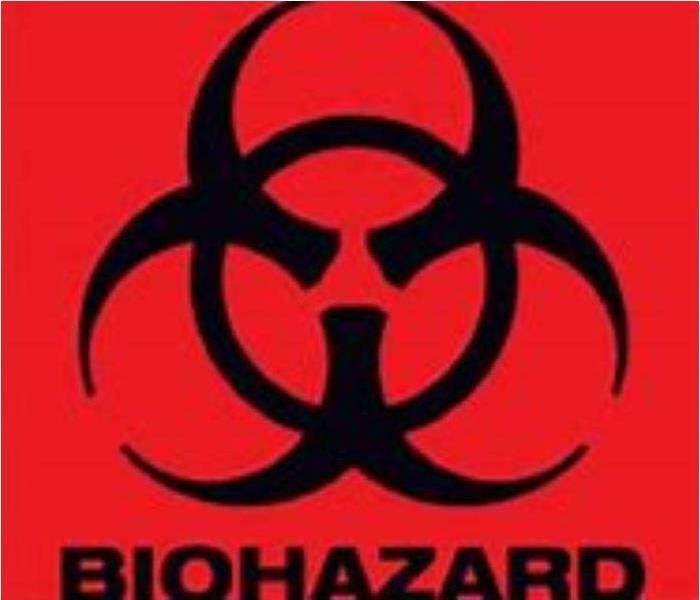 Our biohazard technicians at SERVPRO must follow mandated employee safety regulations and decontamination procedures to ensure safety for all. These regulations that are in accordance with federal, state, and/or local regulations and are in compliance with OSHA, EPA and the State Environmental Agency. The disposal of medical waste must be in accordance with federal, state and/or local regulations as well. Our SERVPRO of West Erie County technicians are trained to dispose contaminated content properly and are also trained in the proper use of cleaning agents. It is important to report, test, and communicate to the adjuster and policyholder why some content is being removed, disposed, and or cleaned with proper equipment. Our biohazard cleanup specialists at SERVPRO of West Erie County are trained to be compassionate and sensitive during a crime scene investigation and during a traumatic loss of a loved one. We will work with you and your insurance company so that work can begin immediately. 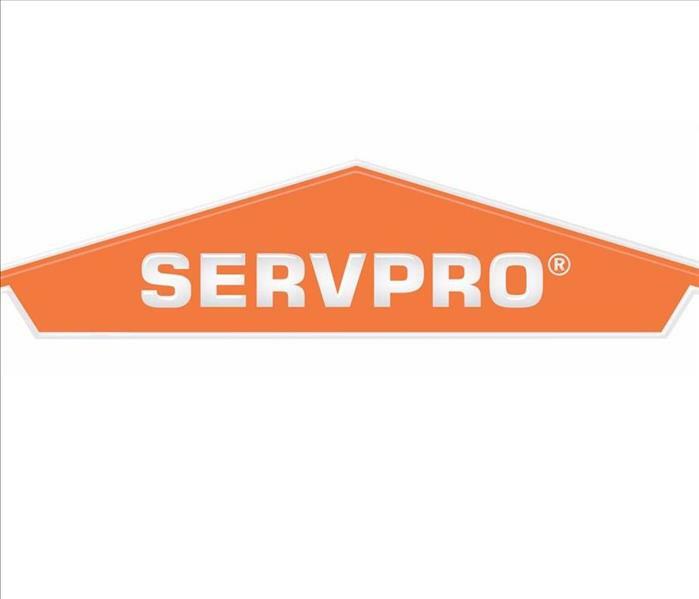 Call SERVPRO of West Erie County for all your restoration and cleaning needs at (814) 806-1987 and stay connected with us on Facebook. “They don’t make’em like they use to” is a saying that rings true for a lot of things. In terms of fire safety, it applies as well. Dating back as far as the 1960’s, a person had up to 20 minutes to escape a house when fire broke out because of the slower burning materials used in home construction. Today, because home construction incorporates of a lot of plastics and vinyl, the amount of time a person has to escape a fire is down to less than 5 minutes. So, it stands to reason that the importance of having a smoke alarm that can activate within seconds of a fire starting becomes of the utmost importance. Over the past decade, the Erie Bureau of Fire Prevention & Investigation supplied city homeowners who needed smoke alarms with free ones through a federal grant. The grant covered 8,000 alarms back in 2013. After a similar grant was approved in 2017, the city purchased another 4,000 smoke detectors for distribution to city homeowners in need. 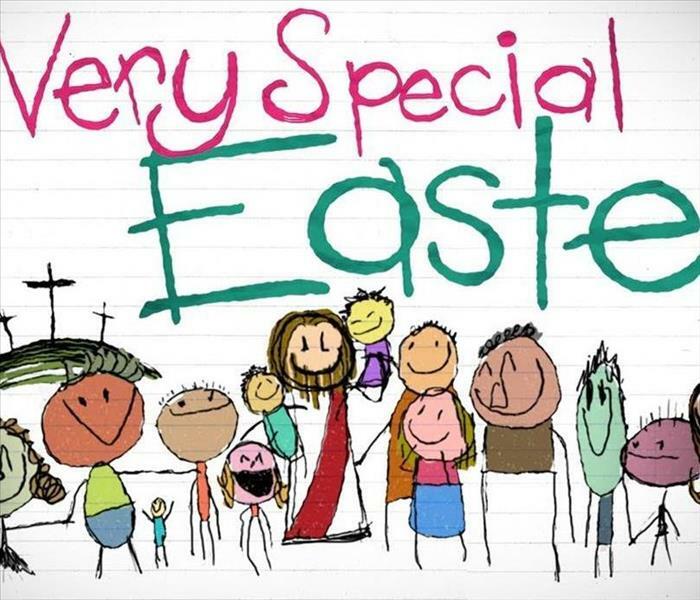 A portion of those were distributed to those with hearing impairments. Hearing-impaired detectors include strobe lights as alerts or vibrating sensors that could be placed under a mattress or a pillow. These distributions have been a part of an Erie Bureau of Fire project in partnership with the Erie County Department of Health. The project, called “Protect the Place You Call Home,” began in 2006 as a way of identifying city residences without alarms. At the time the project started, about half of the houses visited by city firefighters didn’t have alarms, didn’t have enough alarms or had alarms that didn’t work. 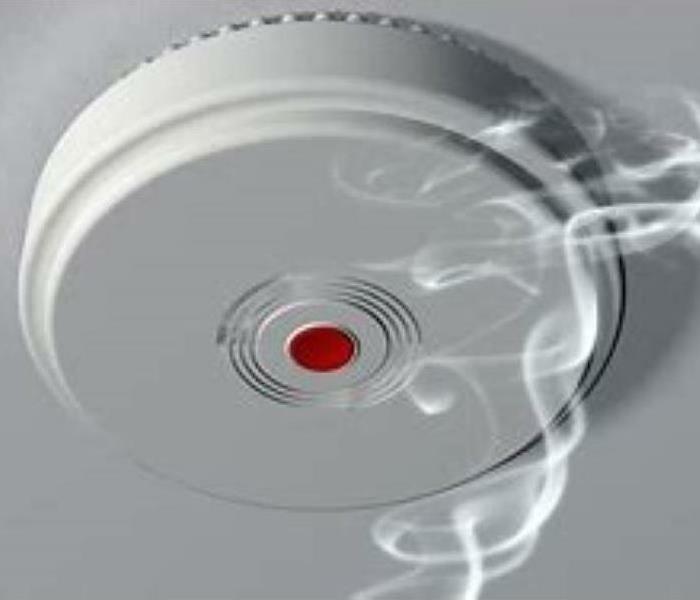 The Erie Bureau of Fire has given out about 22,000 smoke alarms since 2006. Free smoke detectors are available in Erie and the surrounding areas through the American Red Cross of Northwestern Pennsylvania. If you are in need of an alarm, please call the Red Cross at (814) 240-7667 and provide your name, phone number and address. A volunteer crew will be sent to assess your home and provide and install alarms. We think of the wiring in our home as the arteries of power that feeds everything electrical in the household. Do you wonder if parts of it can become damaged or deteriorate over time? Can it present a serious fire or shock hazard? Any of these questions can be answered by an experienced professional. Only an experienced professional can answer to the condition of your old wiring and if your power panel can handle the electrical load of your home. 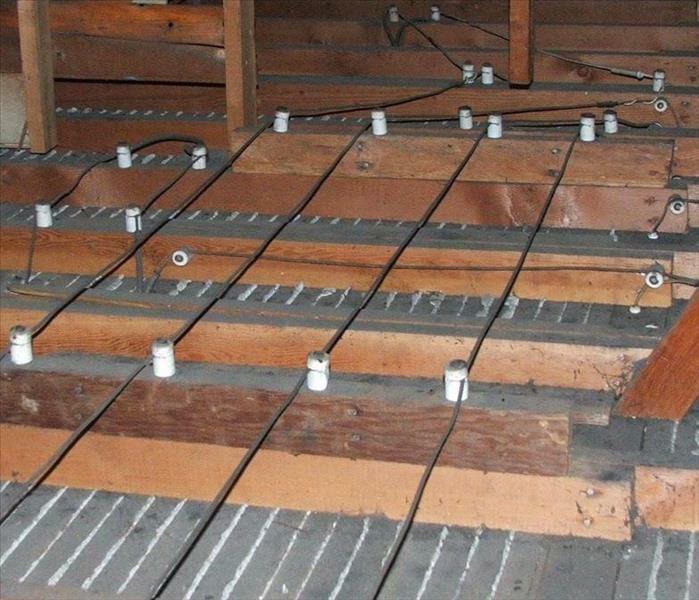 There are a few things to keep in mind to help with the beginning assessment of old wiring. Identify old wiring: Knob and Tube is the oldest type of wiring and we have seen this in some of the older homes we have serviced in Erie, PA. These systems date back to pre1940. Knob and Tube may lack grounding that is needed for safety. You can keep Knob and Tube wiring according to the National Electrical Code (NEC) but you must follow local codes when adding to or changing. Knob and Tube becomes dangerous when the wiring insulation wears away. There can be a problem when alterations weren’t performed properly and to code. And, there can also be issues with covering it with building insulation. All these can be potential fire hazards. If you have concerns about your wiring, contact a professional electrician. If you have a fire, contact the professional fire restoration specialists, SERVPRO of West Erie County. How Erie Became to Be! The Erie Stone on Parade St. In 1795, Andrew Ellicott and General William Irvine were commissioned by the State of Pennsylvania to layout the town of Erie. PA. At the foot of Parade St. is a stone known as the “Erie Stone”, which is the starting point to laying out the town. This information can be read on the “Erie Stone”; it is inscribed there. The town was laid out in three sections, each one mile square extending from the bay south to Twelfth Street. Each section of land had a center which was to be reserved for public use, such as a park. Central Park and Perry Square were the first public areas. 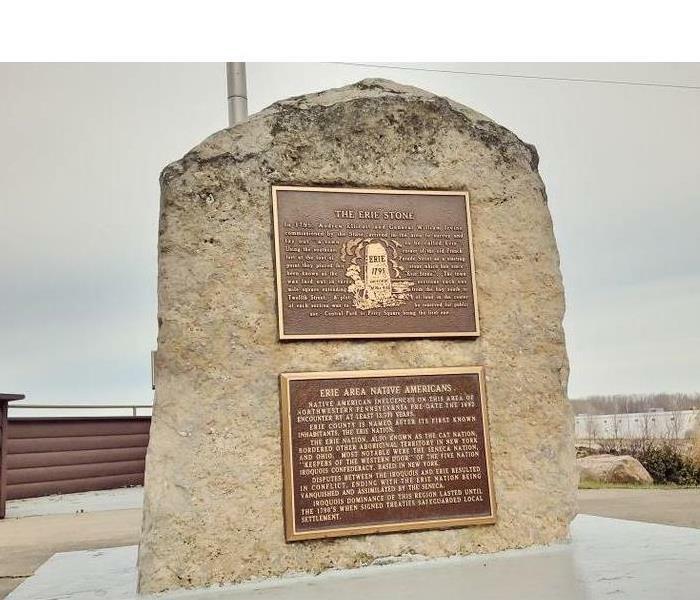 There are at least 8 other markers within walking distance of the “Erie Stone” marker. American Fort, Erie Heritage, Erie Area Native Americans, Fort Presque Isle, Fort de la Presqu’ile, French Fort de la Presqu’ile – 1753, Russian Town, and Hero of Gettysburg. Go to the Historical Marker Database link below for more information. SERVPRO of West Erie County is proud to be part of the Erie Community. You probably wonder how we determine the cost of a water damage job. We discussed in a previous blog that there are various factors affecting the cost of cleaning up after water damage such as the category or dirtiness of the water, the size of the area affected, and the different components affected such as walls, floors, ceilings and contents. Knowing all this, how do we determine a price? We, SERVPRO of West Erie County, use various tools to make pricing standard and acceptable to insurance industry standards. We use customary rates. We want our customers to know how these prices are derived so that they can feel that they are getting treated fairly. 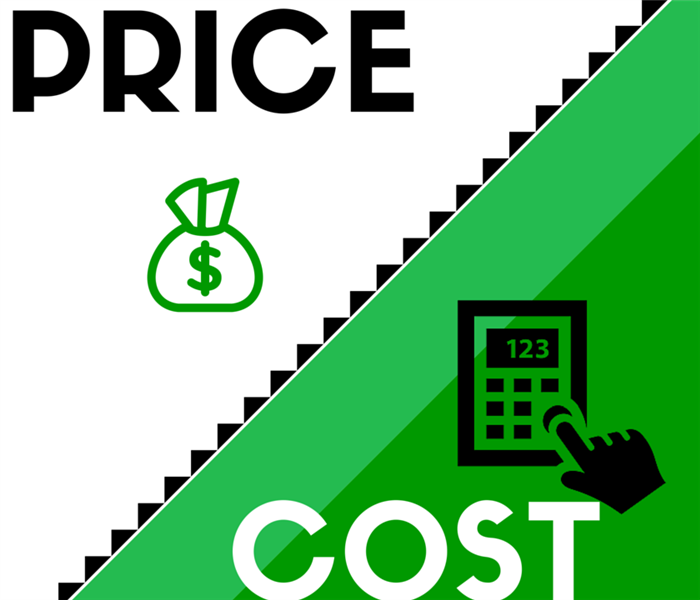 There are three factors to pricing fairly. We use a tool called “Xactimate”. Xactimate is an estimating software of national influence that features a price list with standard and customary prices. According to the Xactimate web page, Xactimate is the industry's most powerful and comprehensive solution for property claims estimation. It is the number one choice for restoration professionals, thanks to its accuracy and flexibility throughout all stages of the repair process. We draw your rooms in the software according to square footage. We then, attach line items that are task-oriented pertaining to your damage. We adhere to industry standards that are established by a standards-setting authority. The most prominent of these organizations is called the IICRC, the Institute of Inspection, Cleaning and Restoration Certification. The IICRC has set standards that say how many air movers and dehumidifiers should be placed on a water damage job. This is based on cubic footage, square footage, and linear footage. The third tool is a SERVPRO developed tool called DryBook™. DryBook™ has the IICRC rules coded into the software. The application tells us how many air movers to place in your room and how many dehumidifiers are allowed based on the size of the room according to acceptable standards. So, with information from the above three areas, we have tools and guidelines that tell us how to accurately handle and price the water damage job specifically for your home. In closing, we want to let you know that our pricing isn’t based on who you are, where you live or if we are in need of business. It’s based on rules and guidelines. We want to be fair and consistent with our customers. We want to focus on doing the best job for you, at the fairest price. 4/1/2019 - How Erie Became to Be!